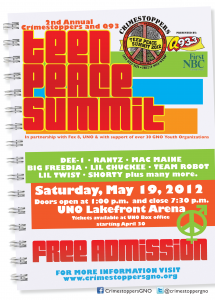 Saturday, May 19, Crimestoppers and Q93.3 FM will reprise the Teen Peace Summit, a free afternoon event for New Orleans-area teens intended to provide both inspiration and constructive opportunities for the summer. Presented in partnership with First NBC Bank, Fox 8, the University of New Orleans and dozens of greater New Orleans area youth organizations, the summit will offer raffles, giveaways, and appearances by local celebrities as well as a summer job fair and mentoring opportunities. Beginning at 2:45 p.m., there will also be live music from a host of local and national performers. Opening acts include J.C. Styles, Kali Red, Lucky Lou and others; the main show, which begins at 3 p.m., features Young Money artists Lil Chuckee and Lil Twist as well as YMCMB label president Mack Maine; also featured are Dee-1, Big Freedia, R&B singers Rantz and Kris Baptiste, rappers Team Robot and more. Doors open at the UNO Lakefront Arena at 1 p.m. and close at 7:30 p.m. Saturday, May 19. Free admission.